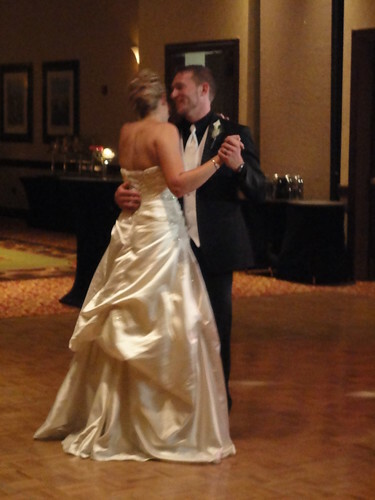 Last weekend was the wedding of Joel Michalski, one of my closest friends, to the lovely and intelligent Dr. Sara May. I was lucky enough to be part of the ragtag group of hooligans that made up the wedding party. In my rented clothes I attempted to balance the onslaught of free alcohol with my new responsibilities of fatherdom, all while taking part in what I am sure was one of my dearest friend’s happiest day. To think I wasn’t even sure if I was going to be able to attend the wedding, luckily Elena was “kind enough” to come a few weeks early and all three of us joined in the festivities . I did feel bad for not be able to go to Joel’s bachelor party but I thought leaving my one week old and wife recovering from a c-section, to drive 150 miles away to partake in the usually drunken debauchery of a man celebrating his last few days of single life was at best a bad idea. The wedding weekend started off in the typical way, with a wedding rehearsal and rehearsal dinner. Mike and Nick, Best man and Groomsman respectively, dressed in their best three dollar suits and afro wigs. The groomsmen were reminded a number of times about the appropriate way to act during the real wedding, I’m not sure why. The rehearsal dinner was at Old Chicago and what can I say…open bar. The wedding was thankfully in late afternoon, see “open bar”. We did the typical picture thing before the wedding. The groomsmen mostly stood around. I felt sorry for Joel and Sara, seeing how they had to be in all the pictures, didn’t get a chance to rest before showtime! Meanwhile, we noticed Mike only had ankle socks, so naturally the fashion faux pas was rectified with sharpies. Yes, we colored his legs complete with Nike swoosh, honestly Mike did most the work himself. The wedding went off without a hitch, though the pairing of me, a man of 5 feet 7ish inches with Tiffany Tanner a women of 6 feet 4 or so inches tall walking down the aisle was quite amusing, she was a good sport to put up with all my tall jokes throughout the weekend. The wedding reception was more good fun and even started off with a bang, literally. One of the groomsmen, Nick, managed to knock a vase off a table as we were making our entrance into the reception. It was a complete accident and probably had nothing to do with us riding around in a limo bus for two hours drinking “refreshments”, but the wait staff did not look pleased. Gillian, Elena and my mother cut out a little early and I fought off the side effects of the last few weeks of mild sleep deprivation until about midnight. I wasn’t the first groomsmen to call it a night but I did feel lame seeing Joel’s Grandmother still partying as I headed to my room. So to Joel and Sara, my family and I wish you nothing but the very best, congratulations and enjoy your lives together! You can see all of my mostly blurry, poorly framed pictures here. This entry was posted on August 4, 2010 at 2:39 am and is filed under Events, Rants. You can follow any responses to this entry through the RSS 2.0 feed. You can leave a response, or trackback from your own site.